At this point, it will be more of a surprise if Justice Stevens does not retire in the next month than if he does. Sorry, Justice Stevens, the SCOTUS handicappers have stolen your thunder.His absence will mark a significant change in the court. As the most senior member of the liberal side of the bench, he was often tasked with authoring – or deciding who would author – the court’s opinion when the Chief Justice was not in the majority. 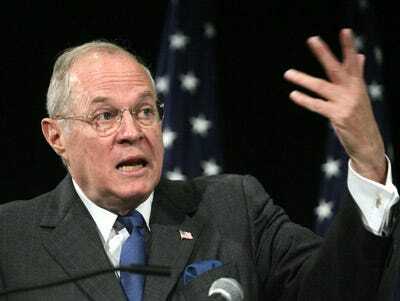 The justice who will fill his shoes in that respect: Justice Kennedy. LA Times: After Stevens, the senior justice would be Antonin Scalia, a 1986 appointee of President Reagan, but he generally sides with Chief Justice John G. Roberts Jr.
Kennedy, a 1988 Reagan appointee, is next in line. Justice Kennedy’s most prominent press year was in the months after September 11, when he created a national “Dialogue on Freedom” speech circuit to talk about “American values.” At the time, the effort created wide speculation on Justice Kennedy’s long term intentions. According to a 2002 Seattle Times article: “Everyone thinks, believes, speculates, that Kennedy wants to be chief justice” said a prominent member of the Federalist Society, an influential conservative legal organisation. Maybe his new prominence will be a close second.